Leicester manager Claude Puel hopes his team can continue their recent improvement over the forthcoming busy festive schedule. Saturday's 1-0 home win against Burnley was the Frenchman's third victory in his six matches in charge and cemented the Foxes' place in the top 10 in the Premier League table. Demarai Gray's early goal gave Leicester back-to-back wins, having defeated Tottenham in midweek, in the first of eight matches they will face in December. "It has been a good week and it was important that we continued our hard work. It was a difficult game and a very good result against a team who were sixth in the table," said Puel. "I am very happy. We had a lot of chances and we could have scored more goals but perhaps we needed to be more clinical. But creating those chances was very encouraging and it was interesting to see the good play on the floor. "It bodes well for the future because my team is still progressing and n ow it is important to continue this hard work of the players. "There are a lot of matches coming up now and we will need all of the players to try to maintain this. There is a long way to go, but we need to continue to improve." The loss saw Burnley slip a place in the table but they still occupy the heady heights of seventh spot. It was just a fourth defeat of the season, three of which have been 1-0, and Sean Dyche also stressed that Burnley remain a work in progress, although he is encouraged to see his team remaining competitive in matches. 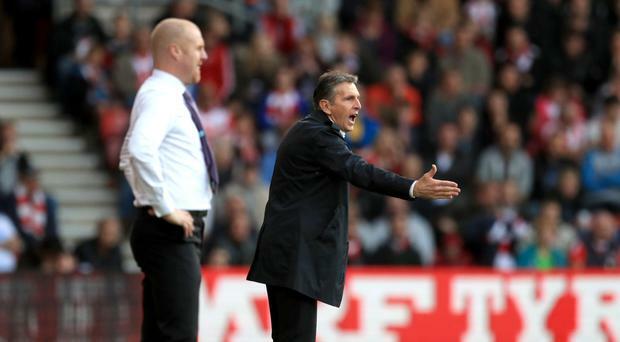 "Often it's fine margins in football," said the Burnley boss. " I like the fact that we are keeping games tight because last season we found that harder and this season we are in every game and we are productive with our play so that is an important theme for me. "We know we are not the real deal yet, but we are improving. W e are progressing and that is an important theme overall and we take on the next challenge as it comes."